There’s an article in today’s Arts section of The Globe and Mail which compares Jennifer Lawrence’s acceptance speech at the Oscars to Anne Hathaway’s. Poor Jennifer. Dressed in an overflowing wedding-design dress she fell on the stairs as she was making her way to accept her Oscar. 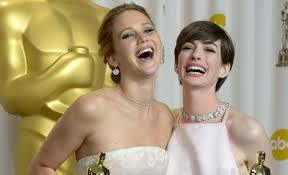 She forgot to thank the two most important people involved with making Silver Lining Playbook. Her speech was short, breathless and amateurish. Anne on the other hand walked gracefully on stage to the microphone. She thanked everyone who needed thanking and gave an obviously rehearsed competent acceptance speech. First Oakville Toastmasters held their Evaluation Contest last night with a whopping ten contestants! Adrian Scott served as the contest Chairman and Eleanor Hayward was the Chief Judge. The evening began with target speaker (Vincent) from the Trafalgar Club giving a speech about his cat, Franklin. Then, the following members competed in the Evaluation Contest: Michelle Kalra, David Webster, Daniel Bruch, Glenn Marshall, Dale Fisher, Deborah Bartucci, John Smissen, Peter West, Val Clements and Kim Bayley. The contest participants clearly illustrated the strong talent for evaluation our Club possesses. The next level of competition will be the Area 52 International and Evaluation Contest on Monday, March 4, 2013. Please come out and support our International Speech contender, Sharon Jenkins, and our Evaluation contender, John Smissen. The location of the contest is at the Oakville Library, Central Branch on Navy St. (near Church) and the contest time will be 7:15 p.m. The 56th annual First Oakville Toastmasters Charter Party is now history. The Bronte Lighthouse Restaurant in Bronte Harbour was the scene for the social occasion of the year with 100 Toastmasters and guests in attendance. President Linda Rossi and her team created a perfect evening of ceremony, contesting, great dining and dancing. Of course the highlight of the evening was the International Speech contest. Chairperson Marion West and Contest Chief Judge Elaine Collins had our four contestants Kim Bayley, Valerie Clements, Sharon Jenkins and John Smissen up and speaking in good order. When the results came in (in what many said was a very close contest among the four contenders) it was Sharon Jenkins who took first place and will represent First Oakville at the Area contest. 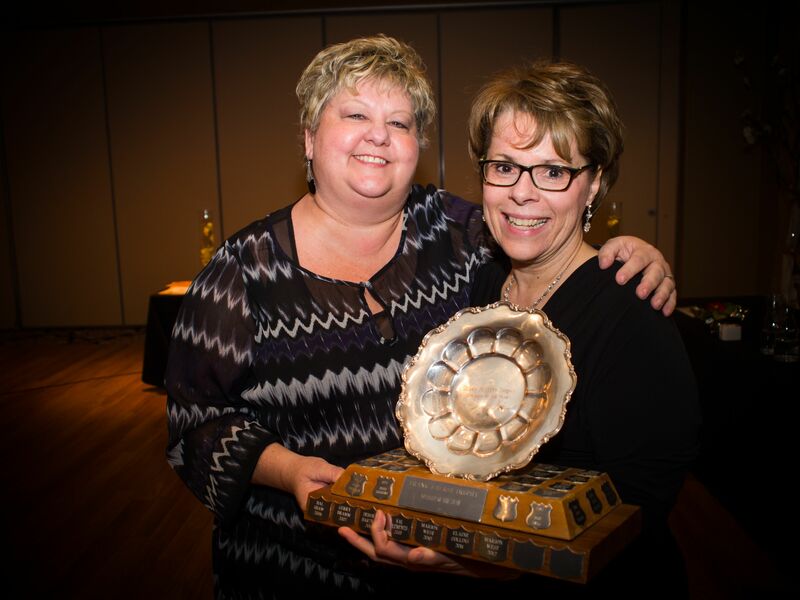 That’s Sharon (left) with the contest chair Marion West. For more photos please visit Peter West Photography and view the First Oakville 2013 Charter Party gallery.